Inspired by https://paulslotrminis.blogspot.com/201 ... eroes.html i started working on something similiar based on BF. I used the Artworks from the Core Rulebook, Hope that is okay. Artworks with front and back would be great for this. This is a very rough, made in half an hour, first version. Last edited by Elouin on Sat Dec 22, 2018 12:18 pm, edited 2 times in total. Nice! I did something like this a long time back; they're on Dragonsfoot I think. Normally I make a reverse silhouette of the artwork for the back. I thought about that too, but didn't know what the License for the Artworks is and didn't want to violate any Artist rights by modifying their Artwork. So for now i have put the Name on the back. Are the Artworks also OGL? I would love to see this become "a real thing", are there any particular steps necessary to make it that? All artwork is Product Identity, not Open Content. With reasonable works and open work progress/updates/collaboration, etc. Solo is usually pretty flexible and accommodating. But he does have the final say on these kinda things. Actually, most of the art is neither Open Game Content NOR Product Identity; artwork provided to me for Basic Fantasy products is licensed to me personally, and may be shared only as I see fit (or as the artist wishes, since the agreement is non-exclusive). With that being said... as long as you post the products you create here, and nowhere else, I see no reason to complain. Being distributed from this site, with my permission, is effectively the same as being distributed by me. I finally had some time to Update the miniatures again. Added in two more monsters, players and some blank ones. Also i changed "Dmg" to "Dam". I was thinking about making this for all the monsters in the Core Rulebook. One of the problems i encountered when starting to do this was, that many monsters have multiple kinds of damage and thats not fitting on the foot of the miniatures(My Current idea is Silhouettes on the back and only the name on the foot). Also, there are a lot of monsters without any pictures(Could i just open a thread asking for these in the Artwork section?). But still i dont know how much sense it makes to put all monsters in there. Though I don't have any art in the core rulebook (only FG1 and FG2) you have my permission to use anything should you need to. As per Solo's final say, of course. My say has nothing to do with it, Teaman. Artists who contribute to the Basic Fantasy Project are giving me a perpetual, non-exclusive license to use their art. This means you may also use that art elsewhere, even sell it, and I have nothing to say on the matter. Great, I'll be out making the big bucks this afternoon! Seriously, thanks for all you and everyone does here at BFRPG. I was just saying this week how I LOVE a one book game. Plus some of my players have added in some extras (half-ogre, barbarian, cantrips and orisons). But I let them keep track of the extra stuff. 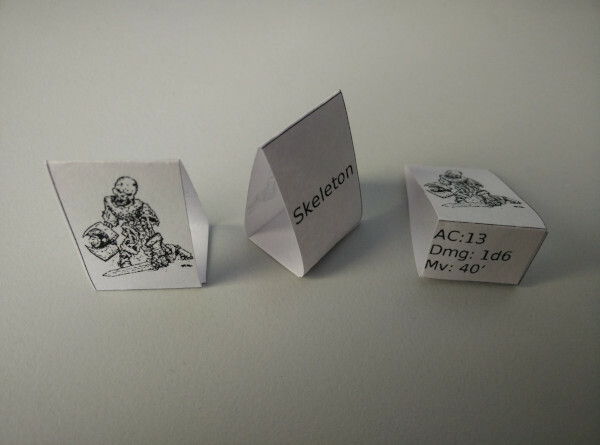 I've been toying with paper minis too. One idea for the back would be flipping the image, and just filling it in solid black as a silhouette. Edit: Crap you already mentioned silhouettes in a reply. I'm really bad at keeping up with you peeps.